The Magnifier software supports from 1.0 through 40 times magnification (in 1/10th increments). It can operate as a Full Screen magnifier or Area magnifier and can be controlled from the keyboard or mouse. It also includes numerous other features that make it a powerful and useful utility! This is truly the first affordable, full screen computer magnifier that everyone has been waiting for! The demo is a "limited working copy for evaluation" which means you can use it for up to 1 hour at a time, then you have to restart it. It will continue to work up to 100 hours total to let you evaluate how it works for you. Then it stops working unless you purchase it. If you want to try before you buy, please print this great Hot-key Shortcut Menu, then Download the Magnifier software. The license is a "personal license" which means you can use the license key and registered serial number for unlocking any of the available downloads for the current version of The Magnifier. If you have a laptop running Vista and a home PC running XP, a single license key will work for both (after installing the appropriate download of The Magnifier). You may also install and license on a USB drive (using the appropriate download) using your license key and serial number. Download the software, make sure it works for you, then click "Purchase License Now" in the IMG License Manager. It's that easy! The downloads available on our website are the actual software products. If unlicensed, then they are run-time limited, and will shut down in about an hour (and can be restarted up to 100 times). When licensed, they are not run-time limited in any way. If you've read this far, then you might be interested to hear how this product came to be. Originally there was a magnifier panel on our on-screen keyboards (now the My-T-Soft family of on-screen keyboards), and we were told by some people that this was all they wanted - a magnification tool. 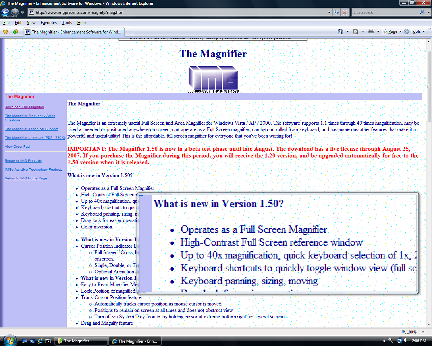 So in 1997, we spent some time and released the first "windowed" magnifier. After some updates in 1998, the product cruised along for many years, and we often had questions about "full-screen magnification". When Microsoft released Windows Vista in 2007, they included a magnification API for the first time, and we felt the time was right to revisit the product and add in features and capabilities culled from user suggestions and available technology - the result is the 1.50 release, which includes everything everyone has asked for. The Magnifier delights many users, and many find it invaluable. This is a product created by customers, a great utility, ideal for many, truly affordable, and worth the download to see if it is right for you. If you want to try before you buy, simply Download the Magnifier software - when unlicensed, it operates as a fully functional demonstration version, and is easy to license directly on your PC. Works with ALL Windows applications. Resizable window(s) for complete flexibility. 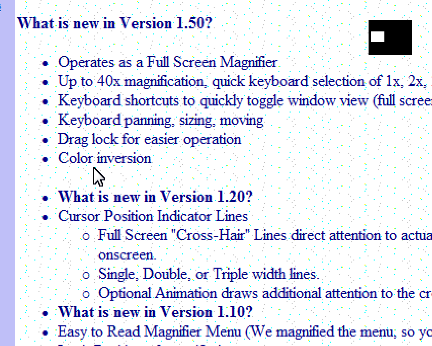 The special Magnifier Menu is easy to read. What's new in Version 1.50? What features were added in Version 1.20? 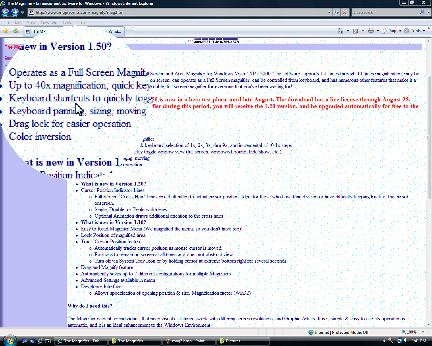 Full Screen "Cross-Hair" Lines direct attention to actual cursor position. Ideal for those who have tunnel vision or have difficulty keeping track of the cursor onscreen. Single, Double, or Triple width lines. What features were added in Version 1.10? Easy to Read Magnifier Menu (We magnified the menu, so you don't have too)! The Magnifier interfaces with the system via the Windows API, and is written to be compatible with any normal Windows application. Certain games and DirectX type interfaces will not operate correctly with The Magnifier (The Magnifier does not use video drivers). Also, because of this, any video issues or display problems are most likely related to the system and not to The Magnifier software. Always make sure you have the most up-to-date video driver for your video hardware. The Magnifier Suggested Retail Price is US $49.95. (comes factory installed and licensed on our "Insert & Run Anywhere" USB Drive). We also offer OEM & Reseller discounts, Keyless licensing, Image Ready integration, and Programming support. Please call 800-889-0987 (+1 818-701-1579) or contact IMG Sales for assistance.